Listed in the National Register of historic Places, the home contains many of the original items used by Dr. Martin Calkins, Wyoming's first Mayor. The office is one of the few authentic country doctor's offices remaining intact in the Midwest from the 1800's. 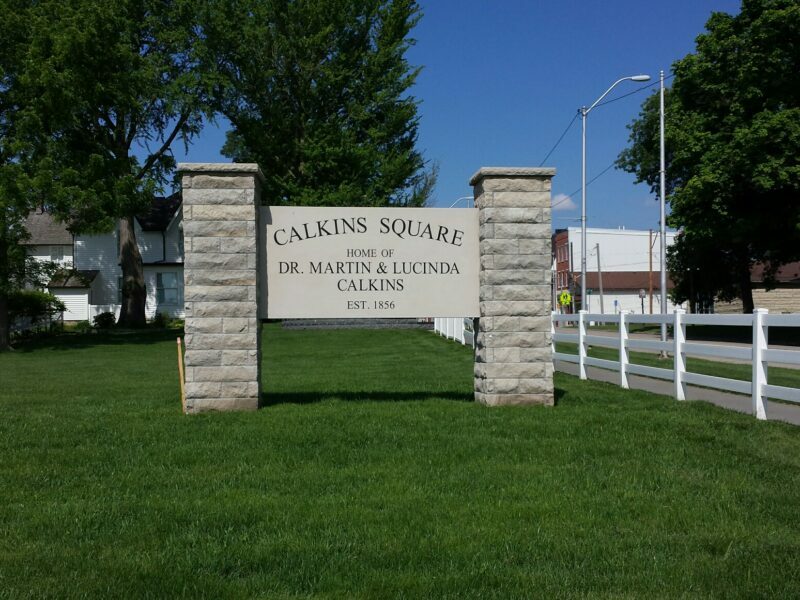 Calkin’s Square is situated on a twelve-lot square block along Main Street (Highway 64) in Wyoming, Iowa. The earliest part of the house was built in 1858. A principal addition on the East side, the music room, is believed to have been built in 1864. At the extreme rear of the house is a woodshed and washhouse. 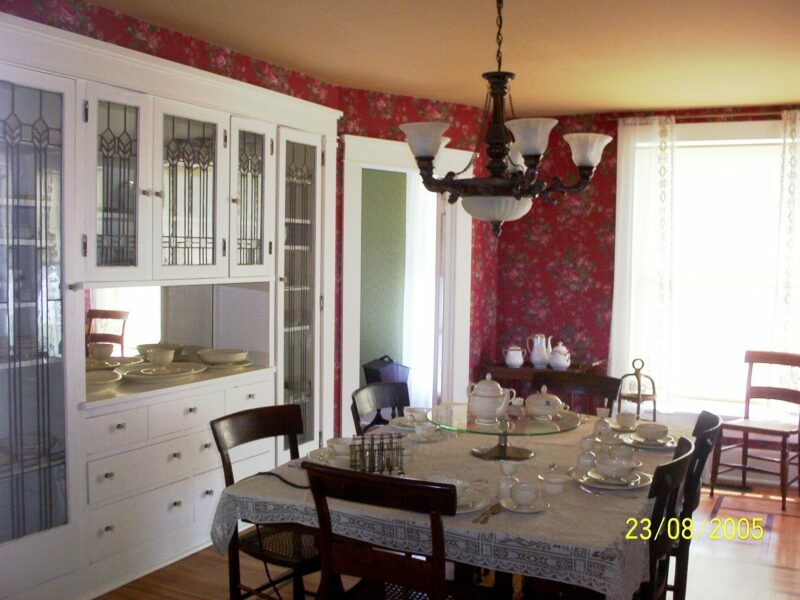 The main floor consists of a entrance hall, parlor, two sleeping rooms, a small bath with tin tub and water closet, dining room, sewing room and kitchen. There are five bedrooms on the second floor. Parquetry is featured throughout the first floor and in the hall of the second floor. The bedroom floors are made of quarter-sawn hardwood. The woodwork consists for the most part of high baseboards and simple, molded door and window surrounds. The doctor’s office is one story, nearly square, with a flat roof. The interior features beaded wide board wainscoting. The doctor’s office still contains the original items used by Dr. Calkins. 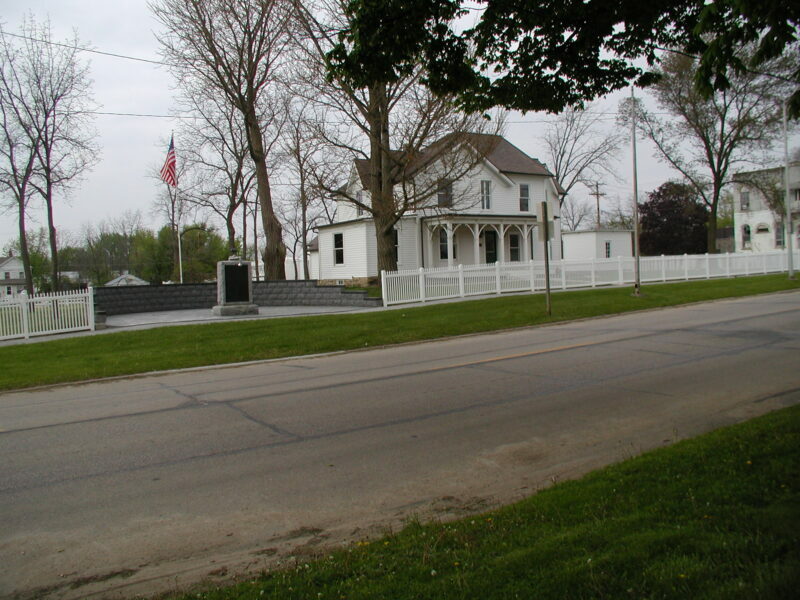 Standing about fifty feet to the northeast of the house is a monument built as a memorial to the soldiers of Wyoming who served in the Civil War. Before his death in 1909, he had ordered the bronze tablet to commemorate the patriotism and valor of the young men of Wyoming. The monument however was not completed until 1912. The collection of furniture includes a melodeon, a rosewood Hallet and Davis grand square piano, a spinning wheel, and a civil war sword. Dr. Calkins was born near Mexico, Oswego County, New York, September 15, 1828. At the age of seventeen he began teaching in the country schools; later in the city of Oswego. He studied at the College of Medicine in Geneva, N.Y., finishing at the Medical University of New York City, and began his practice at Constantia, New York. He married Miss Lucinda Loudon of North Bay, Oneida County, New York, on November 5, 1855. In the spring of 1856 he moved to Wyoming, Iowa. Dr. Calkins resided and practiced medicine for nearly fifty years. In 1862 he mustered into the state militia a company of eighty-nine men who formed Company K of the 24th Iowa Infantry and served during the civil war. 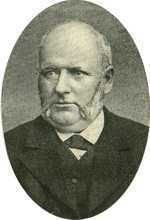 When the town of Wyoming was incorporated the town unanimously chose him as Mayor. In 1881 he was nominated as the republican candidate to represent this country in the Lower House of the state legislature, the democrats made no nomination and the doctor was unanimously elected. Dr. Calkins owned farms in the area. He was a historical authority and wrote under the editorship of J. H. Ely for the History of Jones County in 1879. Dr. Calkins died September 27, 1909, surrounded by his family: Mrs. M. H. Calkins, wife; Mrs. Elva Briggs and Mrs. Mary Chassell, daughters. Location: 104 E. Jones Street, Wyoming, IA 52362. Turn south at stoplight then turn left on Jones St. Viewing the Facility: The facility may be viewed by appointment only. Appointments can be made by calling 319-480-0132. If no answer leave a message and your call will be returned as soon as possible. Parking lot is south of the barn across the street. Handicap parking and drop off is on the west side of the barn. 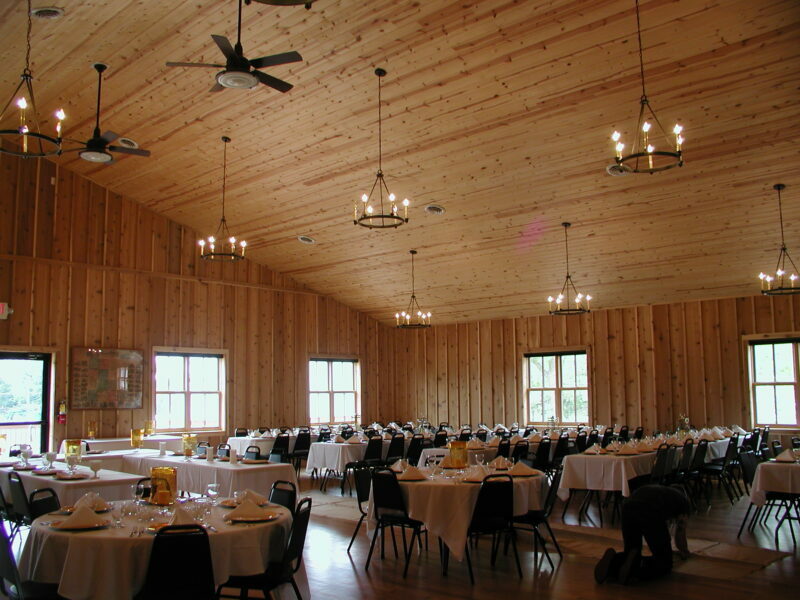 The upstairs room has tables and chairs for approximately 350 people. 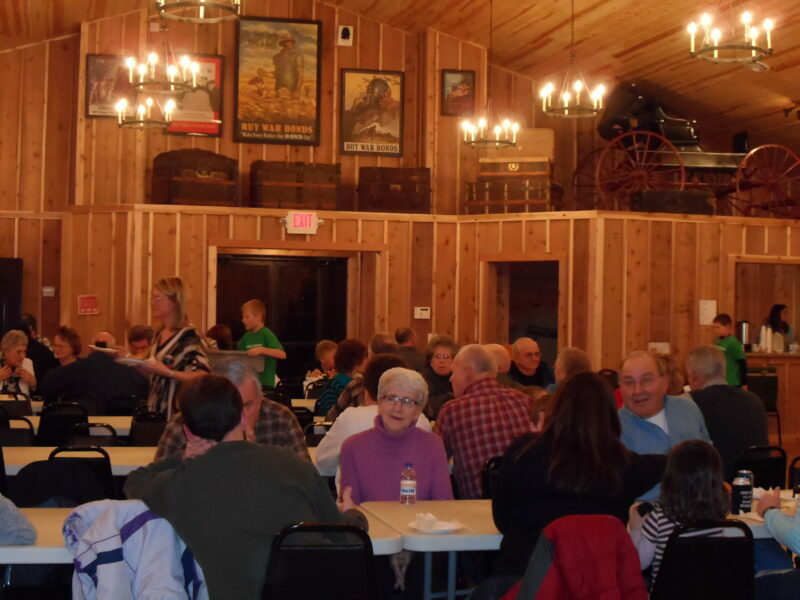 Two of the tables are 60” round tables, 28 tables are 30” x 96” tables. (You can fit 10 people at table without sitting at the ends.) The Basement has 21 tables and chairs for an additional 100 more. Kitchen includes two full size refrigerators (one with freezer on top), 2 stoves, microwave, and 1-three compartment sink compartment sink. The upstairs bar has one refrigerator with freezer on top and bar sink. The basement has a stove, microwave and refrigerator with freezer on top. THE RENTAL FEE IS DUE AT THE TIME OF CONTRACT SIGNING. THIS IS NON-REFUNDABLE. If not received at the time of the contract signing (or if other suitable arrangements have not been made) your reservation request will be voided and the requested date will be made available to others. Telephone reservations will be held for 48 hours pending receipt of rental fee. A $150 damage/clean up deposit for each level rented is required for the use of the facility. The damage deposit is due when the key is picked up. The check will be returned to the renter or shredded after an inspection has been completed by staff. Any or all of the deposit may be retained against cleanup costs, damages or other losses incurred. If these costs exceed the deposit, you will be held responsible for full payment of the damages. Any lost key will result in rekeying at your expense. Payments should be made payable to Calkins Square. In addition, please write your reservation date on the check. A $30.00 service charge is applied to all returned checks. For groups of 50 people or more, and when alcohol is going to be consumed in the Center, renter needs to show Board President proof of appropriate insurance. All Iowa Liquor Laws must be strictly adhered to. Persons reserving and responsible for the group using the Community Center must be at least 18 years of age. The Community center is a smoke-free building. You must report any damaged or missing items within 24 hours of the event. No open flames are allowed- no candles, kerosene lamps, etc. No grills on decks or cement. No patio heaters on decks. NO TAPE, SCREWS, NAILS, TACKS, PUSHPINS or VELCRO STRIPS are to be used on any surface in the building. Also, no confetti, birdseed or double faced tape is to be used inside the barn. Use of tape on tables is allowed. The use of real rose petals is discouraged. An additional fee may be applied if petals are used and cause cleaning problems due to stains or other damage. To prevent scratched floors, tables and chairs are not to be dragged across the floors. The use of bubble machines, fog and smoke machines and dance wax inside the building is not allowed. Please inform your D.J. ANY VIOLATION OF THESE RULES COULD RESULT IN FORFEITURE OF THE DAMAGE DEPOSIT. All rules are subject to the discretion of the Calkins Square Commission and may be changed depending on circumstances.